Prepare the pasta according to directions on box, reserving a cup of the pasta water. Meanwhile, sauté the chopped shallots in the olive oil over medium heat for 3-4 minutes. Once the shallots have softened, sprinkle with two teaspoons of flour and cook for one minute. Stir in white wine until flour is dissolved and bring to a simmer. 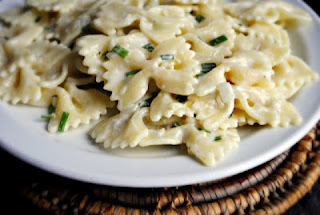 Reduce heat to medium-low and add heavy cream, chives, lemon juice, salt and pepper. Thin out if needed with a little of the reserved pasta water, then divide among plates and garnish with additional Parmesan cheese if desired.